No one ever called West Hollywood beautiful. The streetscape – marked by concrete shells, run-down shops and malls and ugly car lots – is an unrelenting reminder of America’s hollowed-out suburban sprawl. In recent years, though, WeHo, as locals call the area, has attracted a bevy of slick restaurants, hotels and boutiques to rival Beverly Hills. With little fanfare, it has become a hotbed of creative energy, its artistic vibrancy entirely at odds with the uninspiring visual cues. Stepping through the doors of talent-management company Three Six Zero’s new HQ is to realise, once again, just how deceptive outside appearances can be. The Kubrickian influence is distinctive, particularly in the way the individual rooms and spaces, each designed almost like a set piece, have a symmetry and spatial depth. The conceit is a dramatic one and the tone is set the moment you step into the lobby – an austere volume lined on each side with a floating leather-clad bench, and dominated by a solid monolith of a reception desk with a black satin finish. 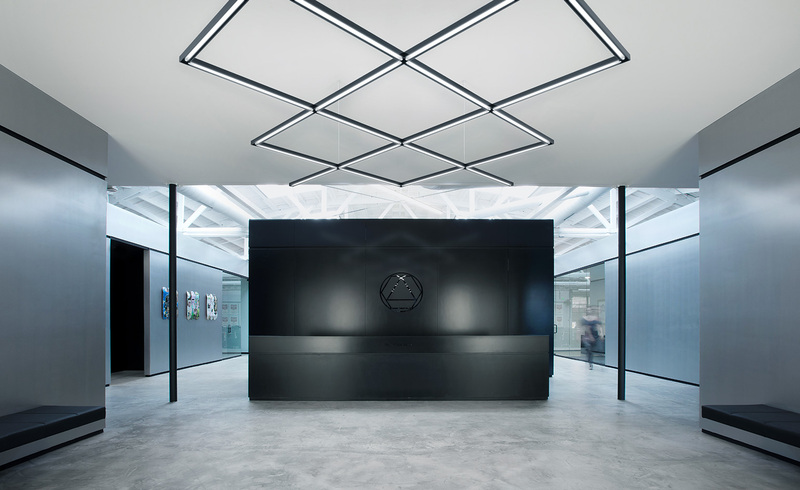 Overhead hangs a flat chandelier in the form of a diamond-shaped trellis, a motif repeated in the open-plan office space and in the artists’ lounge. Polished concrete floors anchor two types of spaces, which are differentiated through lighting and colour. All the offices are bright, naturally lit by skylights carved into the original 22ft-high box-truss ceiling, and touched with silver, white and glossy black accents. 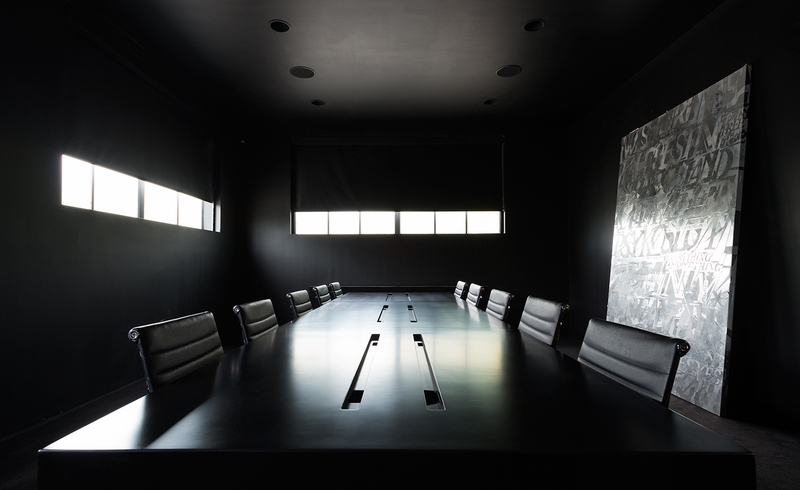 All the communal areas – such as the kitchen, media lounge, conference room and toilets – are largely artificially lit and decorated only in dark graphite and black, in varying gloss, satin and matte finishes. The funereal quality of so much black is offset by judicious applications of silver, alongside thin lighting strips, back-painted glass and, in the conference room, a silver reflective painting by LA-based artist Pia Habekost. The scheme adds a subtle punch, Schaedler says, pointing to the effectiveness of the black in the main office space, where it ‘reflects the sunlight in a nice way, and kind of enhances the way the light changes throughout the day’. For the Three Six Zero partners, this is more than a workplace. Part office and part louche den, it’s the latest salvo in the strategic expansion of a creative empire that now covers London, New York and Los Angeles. And for Optimist Design, it adds to an already extraordinary CV. Not that anyone is resting on their laurels. ‘We are currently working on a photo studio for Nike and our own new office in Los Angeles, as well as a house in Silver Lake,’ says Schaedler, adding that his studio has just finished the design for Kanye West’s Famous music video.